"Capital cities are by definition sites of political power... they are open also sites of resistance, of political counter-power, of protest rallies and headquarters of opposition movements, parties and trade unions." Ever since the rise of the nation-state, few environments have managed to shape the character and culture of a population more than the city. Although many of us rarely take time to appreciate how much a city influences the range of opportunities and comforts an inhabitant does or does not enjoy, the effects of this influence are neither subtle nor implicit. Take New York City, for example. We have mythologized its skyscrapers, which function at once as representations of New York's monumental glamor as well as symbols of the city's corporate greed and socioeconomic exclusiveness. For decades, people have found different ways to verbalize the effects of these massive, towering buildings -- the concrete jungle -- on the collective psyche of New York's inhabitants. For Ralph Waldo Emerson, the city was a sucked orange. For Salvador Dalí, the city was "an Egypt turned inside out" that erected "pyramids of democracy with the vertical organ-pipes of your skyscrapers all meeting at the point of infinity of liberty." For Le Corbusier, New York City was a beautiful catastrophe. In Cities of Power, Goran Therborn inserts his own reflections on the subject. He states, for example, that we are living in a "global moment", and that we can understand contemporary urban style through three categories: verticality, novelty, and exclusivity. He reifies these abstract terms with concrete examples. Verticality, for instance, means skyscrapers. Novelty means a preponderance of business districts and shopping malls. Exclusivity entails gated communities and private property. While we could certainly find European cities that neatly check all those boxes, it would not be absurd to pronounce New York City as the birthplace and the capital of our "global moment", or perhaps even better -- as the global city par excellence. The power is that of transnational, post-industrial, financial, real estate and commercial capital and their upper-middle class clientele… The rationale of the global city is the creation, display and consumption of wealth. Corporate towers, shopping malls and, as protectors of privilege, gated communities and guards are emblematic of the global moment. But there are also other features following from the ambition to attract wealth-creating professionals and solvent tourists, like lavish cultural institutions, globalized entertainment and multicultural haute cuisine. In short, the global city owes its clout and presence to representations of style and power, and it will seek to incorporate those two attributes via its urban layout, its government buildings, its museums, parks, suburbs, and amenities, or the lack thereof. The global city has never been about uniting communities, much like New York was not necessarily ushered into existence to accommodate the poor and huddled masses of the ancient world from across the Atlantic. But as times change, so does the city and its role, as Therborn rightly states: "Capital cities are by definition sites of political power. But popular challenges mean that they are open also sites of resistance, of political counter-power, of protest rallies and headquarters of opposition movements, parties and trade unions." Again, we find the tension between the powerful and the disenfranchised, the rich and the poor, the citizens and the outsiders. This is a tension that New York City has known far too well. It bears mentioning, however, that Cities of Power is not an urban analysis of New York, although Therborn would have done a fine job at that. The book is, in fact, a survey of all the different forces and powers -- the urban, the national, the popular, and the global -- that shapes cities. The author draws his insights from an impressive understanding of the intricacies of urban architecture and of the sociological complexities of human behavior. He knows how this urban architecture interacts with our human behaviors. He has seen the cities he mentions first hand, it appears, from Brasília to Astana. And like any worthy retired Cambridge professor, he demonstrates an encyclopedic knowledge of world history spanning multiple centuries and regions. 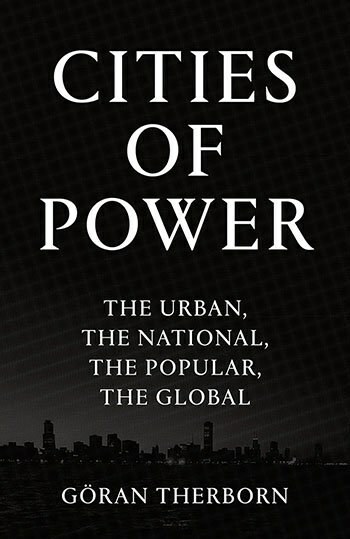 Nevertheless, Cities of Power is not a book for the casual reader. Therborn's ideas emerge from large blocks of text and serpentine sentences that will bog down some readers (this critic included) whose interest in the sociology of power and urban landscapes amount simply to a nascent curiosity. For all the knowledge and ideas contained therein, Cities of Power would benefit from snappier, tighter prose and some smoother transitions between ideas. Not all books written by academics need to sound like they were written by academics. Stephen Pinker and Daniel Kahneman, for example, do an excellent job of preserving the wondrous aspects of esoteric and abstract topics while also keeping the writing accessible and vivid. For fans and scholarly devotees, Cities of Power is one more publication in a sparkling list of career accomplishments and might function as an important resource for many a sociology doctoral student. For the everyday inhabitants of the world's cities, however, perhaps a more approachable first step would be to look around at one's urban environment and ask the question Therborn asks: how did this city come to be and what does it reveal about the power dynamics among its citizens?